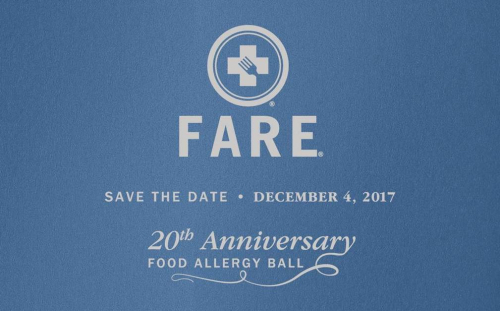 SAVE THE DATE, 20th Anniversary Food Allergy Ball @ The Pierre. To commemorate the anniversary of this signature event, the evening will honor “20 for 20,” a special tribute to the individual and organizations that have made a lasting impact in the food allergy community and have contributed to 20 years of progress in food allergy action, research, education and advocacy. Sharyn T. Mann will receive the Founders Award for her dedication and longstanding commitment to raising awareness of the seriousness of food allergies and to FARE. Restaurateur Charles Masson of Majorelle, will receive the Lifetime Achievement Award for his commitment to excellence and compassion for diners with food allergies. Walt Disney Parks and Resorts is the Corporate Dinner Honoree. Karen and Lianne Mandelbaum are the Gala Dinner Chairs. Joseph Ianniello, Chief Operation Officer, CBS Corporation, is the Corporate Dinner Chair. Liana Silverstein Backal and Arthur Backal, Nina Rennert Davidson and Mitchell Davidson, Kathy Franklin, Abby and Robert Goldstein, Helen and David Jaffe, Nicole and Marc Lenner, Roxanne and Dean Palin, Joelle and Jonathan Resnick, Diana and Ira Riklis, and Stacey and Marc Saiontz are the Anniversary Dinner Chairs. The festivities for this black-tie Gala start at 7:00 p.m. Ticket prices are as follows: tables are available for $100,000, $50,000, $25,000, $20,000 and $15,000, and individual tickets are available for $5,000, $2,500 and $1,000.